A mindful flow exploring the seven key energy centres (chakras) through the 5 senses. Wearing a blindfold takes away the boundaries that sight can create- the expectation of what your body looks like in a pose is removed (along with comparison). Your attention moves completely inwards (Pratyahara) and you sharpen your other senses. How does the verbal instruction materialise as you interpret different cues? Without sight, you can feel subtle sensations, the sound of transitions and the breath; which all help enhance the quality of your movement and awareness of the body in space (proprioception). It is both a liberating and humbling experience that anyone can take part in and benefit from (although some experience of Yoga would be useful). Alice has previously taught this class on a retreat, and is experienced in practising this way herself, understanding the need for it to be an easily paced flow working from the ground up, so that everyone can follow. The process of wearing blindfolds sheds a whole new perspective on what we call a ‘pose’ or a ‘sequence’, as really just shapes shifting through space. 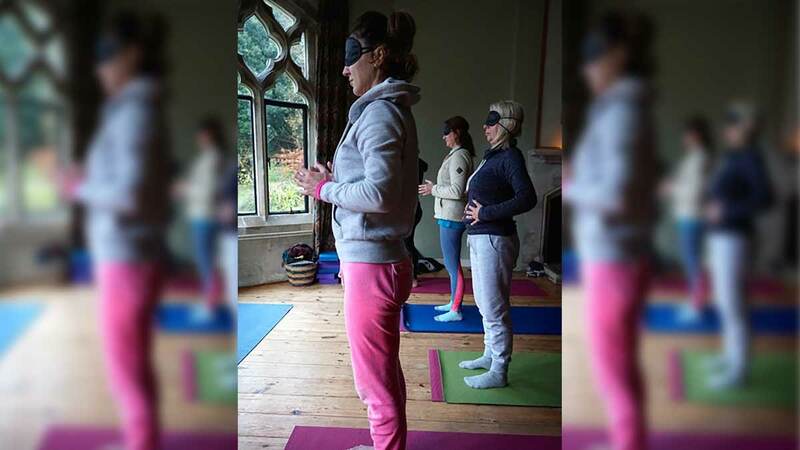 Guests who attended this workshop on the retreat shared their enthusiasm for the practice; they were positively surprised that it actually increased their confidence, helped them to form a more trusting relationship with their body and it’s capacity to move, while enabling them be fully present.